Though my son has grown a little old for Thomas the Tank Engine, his eyes still lit up when he saw a life-size version of the train in Baldwin City on our next stop. As the leader of our trip, I was impressed by how organized the event was and how well prepared the city was to welcome the huge crowd of visitors. There was a carnival-like atmosphere around the station with Thomas products for sale, live animals, balloons and more. The kids were adorable and it was refreshing to see their faces brighten with each “toot” of Thomas’ whistle. Next we were off to the Battle of Black Jack in Baldwin City. The park is open year-round, but annually on the anniversary of the battle the area comes alive with re-enactors and crafts people. My family loves food and we headed straight for the Indian tacos and the BBQ brisket for hungry visitors. I met so many fun people eager to tell me why they love Kansas as we took photos and video to share online, spreading knowledge of our exciting state. My son loved getting up close to live horses and trying out a banjo made from a gourd. While my parents and I watched re-enactors present the dramatic Battle of Black Jack, we passed around a bag of fresh-made kettle corn and sipped limeades in the shade. The next day we woke for a trip to Abilene for delicious fresh-fried chicken and awesome coleslaw at the Brookville Hotel followed by a performance of “Buddy!” at the Great Plains Theatre. The show runs for a couple more weeks and if you savor good music you’ll love the high-energy of this rock-n-roll show. Buddy Holly knew how to get a crowd on its feet and Greg Krumins, who portrays Buddy, lives up to the legend. What a terrific weekend! I can’t wait to hear about all the other tour stops on the Faces and Places tour. 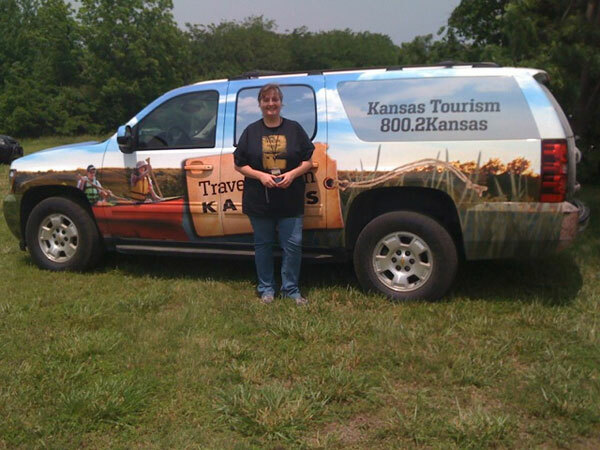 What places do you plan to visit in Kansas this summer?